Yes, I want to change my movies and change my life! I can ORDER NOW and SAVE $40! P.S. In addition to the 7 main CDs in the program, I'm loading you up with bunch of terrific extras, plus a FREE eBook I guarantee you will LOVE. Scroll down to find out more about this awesome freebie, then click the link to get it, along with your RISK-FREE program order. FREE eBOOK: “101 Ways to Magnetize Money… In Any Economy”. See details below! If I do not find this program to be life changing, I can return it any time within 30 days for a refund or even exchange. No questions asked. Does the ideal life you picture in your mind include NO financial worries? In your "perfect world", are you wealthy and debt-free? 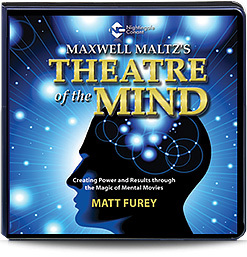 Then you'll LOVE the free gift I'm including with every risk-free order of Maxwell Maltz's Theatre of the Mind. It's my now-legendary ebook, "10 Ways to Magnetize Money… in ANY Economy." … plus 98 MORE simple, powerful ways to clean your "money magnets" and get cash flowing into your life quickly, easily, and automatically — no matter what the market is doing or what the talking heads on TV tell you is going on. Skeptical? I understand. That's why I'm giving this little ebook to you ABSOLUTELY FREE. No risk, no strings. Give a few of these ideas a try… and just see what happens! You've got nothing to lose, and a LOT more money to gain. “Even though I started my business on the first day of the worst economy since 1929, I was able to do six figures in my first year and every year since by putting the strategies you’ll read about in this book into practice. It really is as simple as reading the words on the page, believing that they’re true, and then putting them into action.